UK customers (only): To reduce the shipping fee you are charged, use this page to order the pamphlet. Non-UK customers: click here to order the pamphlet. Published by Marxist-Humanist Initiative, May 2018. 88 pgs. 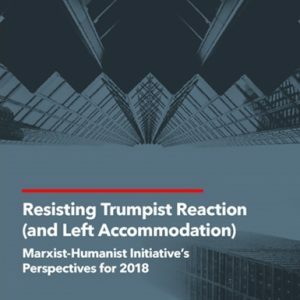 This 88-page pamphlet provides our analysis of and response to: Trumpism and leftist accommodation to it; the Resistance; left-populist economics; “post-truth” politics; white nationalism; and individual responsibility for the collective development of Marxist-Humanism. It may not be possible to stop US president Donald Trump before he launches the country and the world into a monstrous war, even a nuclear war–and the threat Trump poses to Americans’ civil rights and liberties could be just as fatal. MHI’s Perspectives detail these dangers, but also the strength and determination of the Resistance to defeat Trumpism. We offer the Resistance our ​full support, but warn that it must remain independent––of the Democratic Party and of tendencies on the “left” that would divert it onto an “anti-neoliberal” path. Its goal of ending Trumpism must not be subsumed under ​others’ agendas and myths about how to defeat capitalism. These Perspectives challenge the idea that the left can win over Trump’s base and turn white nationalists towards revolutionary socialism. We review a wealth of research which shows conclusively that Trump’s election was not a “white working class” revolt against neoliberalism. Yet that myth remains a key talking point of a newly-resurgent left-populist current. Left-populism seek to win adherents by appealing to popular superstitions and myths, and by offering easy-but-incorrect answers in response to popular discontent. Yet a politics rooted in emotional appeals and myth-making hinders genuine understanding of our current crisis and how to transcend it, and it reproduces existing divisions between mental and manual labor and between leaders and the led. Thus, “post-truth politics” is a real barrier to the self-development of the working class as an independent force for human liberation. The Perspectives argue that, far from being a revolt against neoliberalism, Trump’s election was an expression of a white-nationalist strain of US politics that long predates neoliberalism. Analysing Marx’s writings on Irish independence and the US Civil War, we arrive at a unique conclusion regarding Trumpism and the so-called “white working class.” To fight white nationalism in the tradition of Marx, ​the way to solidarize with the “white working class” is by helping the Resistance to decisively defeat Trumpism and other far-right forces. Their defeat will help liberate the “white working class” from the grip of reaction and thereby spur the independent emancipatory self-development of working people as a whole.